I'd like to knock down a little bit of feedback from my Casino. Is a sound post the best way to accomplish this? I'm pretty handy and have plenty of woodworking tools. Any tips on how best to make the post, where/how to install, etc. Give me your secrets! Hi Otter, that sounds like a good idea. They can be prone to feedback. I know my '67 ES330 is. My first thought was to google violin makers. They install the sound post from the outside. It's just a loose piece of round wood that they made to fit between the top and back with some tension. I would just try that. And you can always move it around or take it out again. It's not glued in. There are lots of them but here is one where it is explained clearly. I would agree to let someone more familiar make and install the post. There are tools that make this job a lot easier, the shape is important, and then again putting it in the right spot makes for better tone. Hopefully, you have a qualified someone close enough. I've done it. It's fiddly, but not hard. The serious violin guys, apparently carve the ends of the post to match the top and back...not sure how they do that. Make an impression with clay, maybe. I held the sound post by jamming a sharp dental pick-type tool into it. I made it so it JUST stayed in place with the strings slack, and it's in there tight with the strings under tension. Must remember not to take all the strings off at once when changing them. Found that out the hard way. This helped feedback, but made it sound like crap acoustically, but it is, after all, an electric guitar. F-hole plugs work better. I saw a pic once of, I think, Tommy Tedesco in the studio with a really nice ES175 with duct tape over the f-holes. I cringed, but guitars are just mass-produced tools for guys like that. And...BTW...why do I never get line breaks in my posts? Upright basses have them as well. You must maneuver inside the “F” holes and tip the posts upright into place. I seem to remember doing this with the “King” bass I used to own. I've done it once with a cheapo hollow body. I cut two pieces of the handle of a wooden spoon to size and jammed them between the top bracing and the back, about where the bridge sits. Even though this is a thread about a sound "post", I assume that your question pertains to the post that you created within this thread. You get breaks in your posts when you hit the return key. Just like when writing a letter or a document, when you have concluded a paragraph, just hit the return keey twice and you will be starting a new paragraph. The sound post (and yeah, you can do it yourself) will help focus the tone by coupling top to back. You're likely getting a combination of overtone series now, some off the top and some off the back. Those contribute to the acoustic richness of the guitar, but get more problematic the further the volume is cranked. While it does both (in my experience), the soundpost does more to couple top and back and link their periods of resonance that it does to damp the top or stiffen it against feedback. You end up with a more focused tone, with an arguably less rich cloud of overtones - but a less vague one as well. At volume, it will the turn wide-ranging multi-frequency woofy whole-guitar-shaking feedback you may have been getting into a middy howl centered around a much narrower band of frequencies. That may make it easier to ride or control with position of guitar relative to amp, arm damping, etc. But the pickups are, as neatone says, likely to be the main culprits. It's not only their midrange voicing (and thus, range of feedback), but also the resonance of the metal covers and their loose fit over the body of the pickup. If you're getting a high-pitched schtuckened-pig squeal...that's also the pickups. Maybe New Gibson Czar will figure to save some money by covering cheap plastic covers with worn denim. That would sound better. I, like, really really like my MIK Casino - but I know it's no better than it should be, and that its pickups have issues. I avoid situations where it bites me, but if I was a young rocker hell-bent on riding it hard, I'd just assume that learning to handle the bucking bronc was all part of becoming a man. Thanks all for the opinions. It's remarkable how when looking for tips on a mod, most people around here just tell you not to do it. "Hopefully you have someone qualified"? Give me a break! I thought this was the kind of freewheeling place where we cut up guitars and add bigsbys and swap pickups and blow up amps. I remember a lot of discussion around here about making and installing tone posts, so I thought I'd ask for a tip or two. I guess I'll look elsewhere. Regarding the pickups, yes they are howlers. I took mine apart last year and unwound about a mile of wire (I also flipped one coil, to make it buck hum in the center position), cutting the output down to 8 and 9k respectively. They're much brighter and better behaved now, though no amount of potting seems to tame the microphonic chrome covers. I bought plastic dog ear covers, but I haven't found my round tuit yet. I noticed my 2011 MIC 50th Anniversary Casino has a small, thin block connecting the top and back close to the bridge. I'm wondering now if all of the modern Casinos are constructed this way. The guitar still has a wide open acoustic sound. The placement of this block must have been thought through. I am not sure if locating the position for a soundpost in a viola is the same as locating the soundpost position in a guitar, but I found this to be pretty interesting. And here he actually installs a soundpost in a cello. There may be some transfer of application to installing one in a guitar as well. I'm sure you've figured out that by default the soundpost generally goes under the bridge. That's the place to start. I've used dowel rod of half-inch or greater diameter (I don't think species matters much). I measure inside the guitar from the back to the bottom of the top, as close to the location under the bridge where I intend the post to go. Given radius of top and back, and the fact that you likely won't be able to measure in the exact location, a little guesswork is required, taking into account the trend of the shape between measuring location and intended post position. All of these decisions go by feel - your sense of the elasticity of the wood panels involved. It's pretty duh: if you make the post too short, it will fall over. If you crack the top or back, you made it too tall. (I've never cracked either.) I'm no kind of wood whisperer, and if I can figure it out, I figure anyone can. I've also worked with wider, square/rectangular posts, based on my instinctive sense of just how much stiffer the body needs to be. That is, I guess. Glue has never been involved. Where there is a radius to the top and bottom, Proteus, shouldn't the top and bottom of the soundpost also match that radius? The video that I posted above about fitting a soundpost into a cello seemed to suggest it. Also, the speaker suggested that the grain of the wood should run perpendicular to the strings. Have you ever concerned yourself with that level of detail? I mentioned matching soundpost radius to the mating surfaces - and it's definitely the craftsmanlike way to go about it. But over the diameter of a 1/2" dowel, it's a pretty slight curvature. With a wider post, absolutely: try to match the radius. You can measure the radius of the top and bottom from the outside of the guitar (likely easier than getting a radius gauge inside), at the soundpost location, and assume the inside radii will match. The perpendicularity of the grain takes care of itself with a dowel, and with lumber sold by the linear foot, I've cut the post with the height running along the grain. So yes, I guess I did that - though I don't recall having consciously thought about those choices. I am not sure if I didn't make myself clear or whether I am simply not tracking what you are saying (high probability that it is the latter given my woodworking skills), but what the speaker in the video that I posted above suggested was that the grain of the dowel can likely be seen on the end of the dowel. He suggested that the visible grain on the end of the dowel should be aligned so that, when installed, that grain would run in a direction that would be perpendicular to the direction of the strings yet parallel to the top of the guitar, if that makes sense. The cello video was fantastic - thanks for posting. Learn something new every day. Seems that the requirements for a guitar sound post are less exacting, since it's not really about transmitting the sound in the same way. 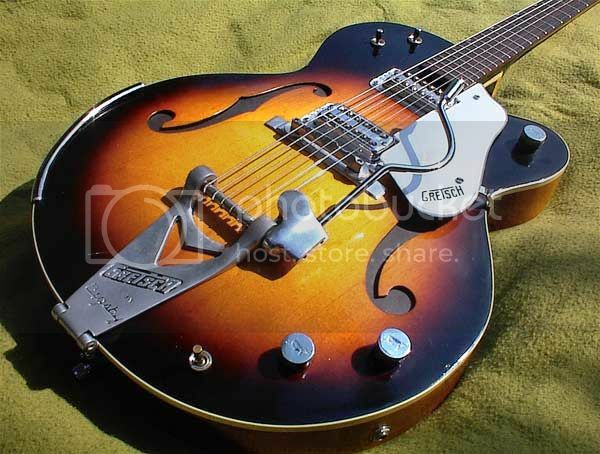 This is why, other than plywood archtop electric guitars designed to play amplified, loud! and looking to reduce feedback and or increase sustain, soundposts are generally (read almost never) NOT part of the design of an archtop acoustic. Guitars are not just strummed or picked violins, despite similarities in construction and shape. 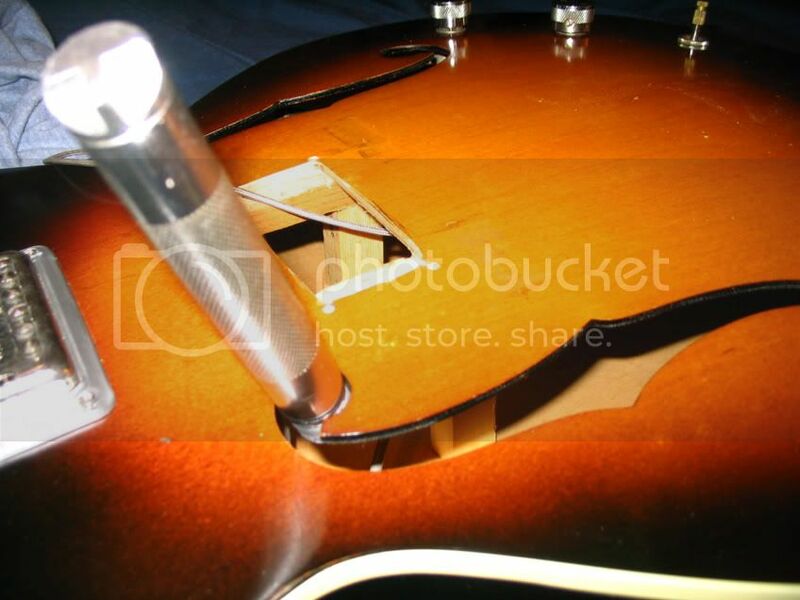 The function of what is mistakenly called a 'soundpost' in a guitar is different in a violin. I put one into a Peerless Wizard, one very feedback prone guitar. The post did help some, and did change the sound somewhat. But the post alone did not make that an easily gigable guitar. I agree with Charlie C. F-hole plugs would be more effective than post alone. F hole plugs too...car wash sponge cut in half and black construction paper a la Duane E.